When I was little, I had a giant stuffed toy named Gumby. Gumby was big–bigger than I was!–and green. He was a character from a show I watched on TV, which was made with stop motion animation. Gumby was fun to jump on, because he was squishy and soft, so my little brother and I jumped on him a lot. After a while, Gumby started to look a little lumpy and worn out. I wished I could make him look new, but I didn’t know how. 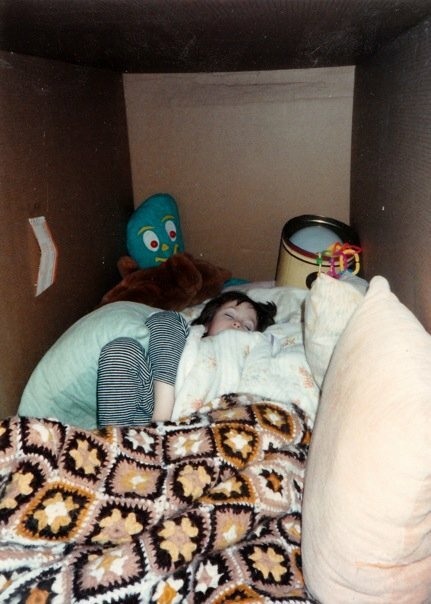 Here I am when I was about five years old, sleeping in a giant box that I turned into a fort when my parents got a new refrigerator. In the way back, you can see giant green Gumby, and in front of him, one of my other favorite stuffed toys, Sue Bear, who is brown. I sewed a little bit with my mom when I was growing up, but I was afraid to use her sewing machine because I thought I was going to get poked by the needle, which moved really fast. After reading books in the American Girl series, I became interested in doing embroidery like the characters Felicity and Samantha did in their stories. When I was about nine years old, I taught myself how to thread a needle, make a knot in my thread, and make patterns with my stitches. 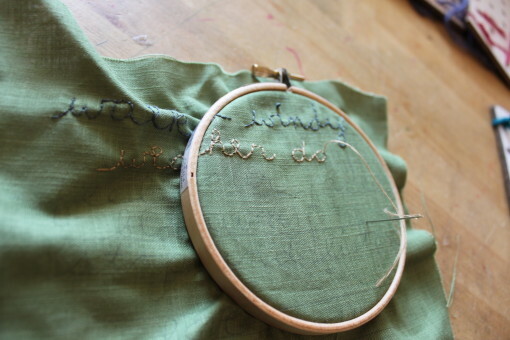 I felt very fancy when I embroidered and pretended that I was living in a different time. 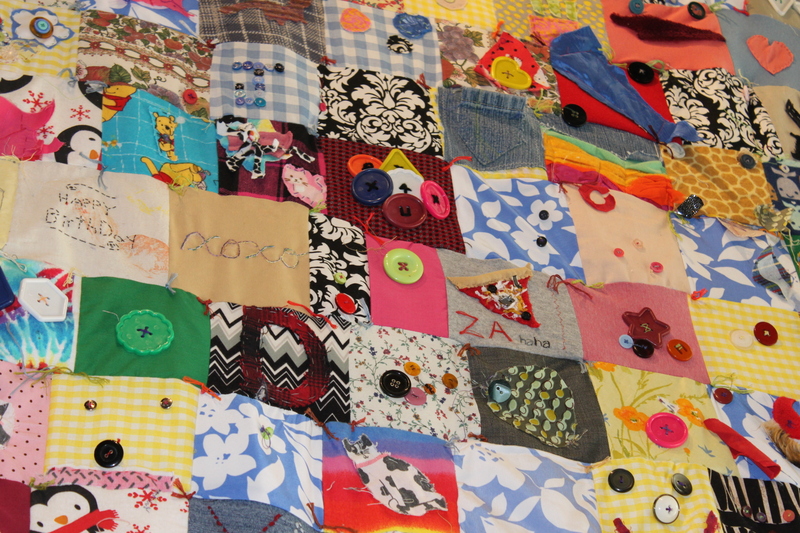 However, I didn’t stick with sewing as a hobby for very long, although it would have been helpful if I had. When I began Irish dancing, I started to wear very elaborate embroidered dresses. These dresses take hours to embroider and sew together and can cost more than $1,000! The fancier and more complicated the dresses are, the more expensive they are because of the hard work that goes into embroidering them. If I had continued to sew and gotten good at it, I could have made my own dress, but instead my parents bought them for me. 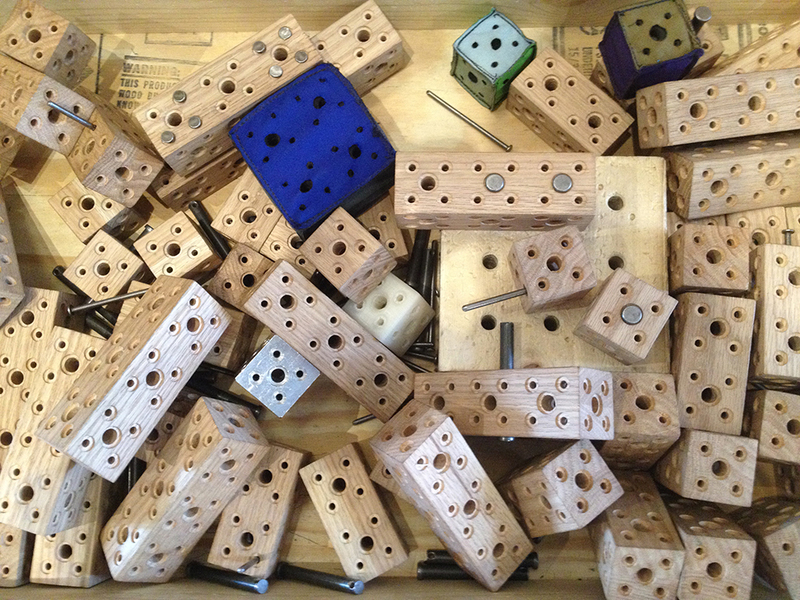 When I started working at MAKESHOP, I didn’t remember much about sewing. Other teaching artists taught me the basics again, plus some tips and tricks to make sewing easier. 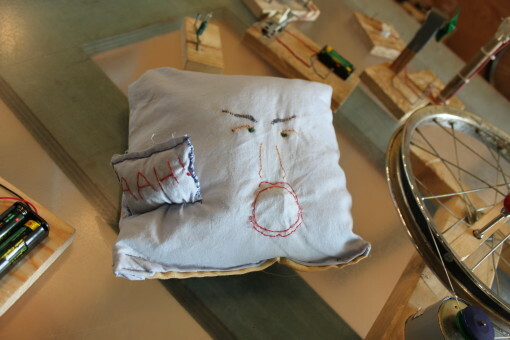 They also taught me how to use the sewing machine, which I loved trying. Now, I teach kids and adults how to sew and know that needles and the sewing machine aren’t dangerous to use as long as everyone learns how to use them the right way. I really love sewing now, and I can’t wait to try new sewing projects in MAKESHOP!